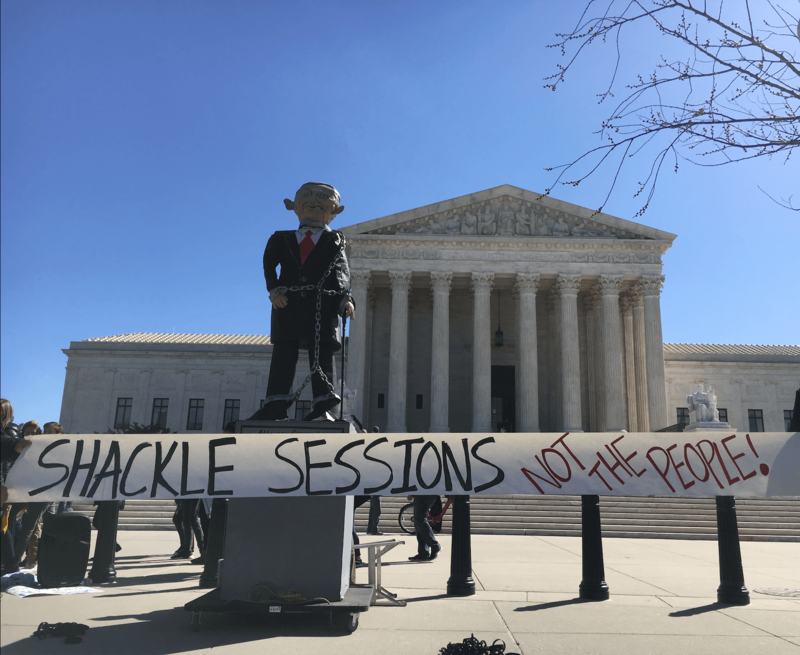 Washington, D.C. – A statue of Attorney General Jeff Sessions was be unveiled in front of the U.S. Supreme Court today by Latinx and immigrant rights organizers, calling attention to the defense of the Department of Justice in favor of chaining and shackling all people appearing before a federal judge. In the case, United States vs. Sanchez Gomez, being heard on Monday, the U.S. Supreme Court will determine whether to reverse the Ninth Circuit’s decision holding that shackling and chaining a defendant whenever they appear before a judge in a federal court violates their constitutional rights. The U.S. Department of Justice will argue in favor of reversing that decision, allowing for the use of chains and shackles. The decision of the Supreme Court would impact any defendant who is presenting themselves in front of a federal judge, including immigrants and U.S. citizens facing federal charges. The U.S. Department of Justice will argue for the shackling and against a previous conclusion of by the 9th Circuit Court that this practice violates people’s constitutional rights in June 2017.